My apologies for the extreme delay in getting this post up. I ended up having to switch gears at work a couple of weeks back. It’s all good though, I’m having more fun than I’ve had in ages, but needed to play some initial catch-up! Daredevil #12 contains the kind of twist that encourages you to go back to the previous issue to double-check whether there were any signs pointing us in the direction of the revelation in question. I did, and found none. I can’t quite decide whether this is necessarily bad (or good), but it is certainly a more accurate reflection of real life. Life throws your curve balls all the time. In this issue the more interesting scenes, in my opinion, deal with Matt’s reaction to being blind-sided (no pun intended). It raises interesting questions about how much he depends on his usual means of doing things, specifically detecting deceit. If you’re used to having a nearly infallible ability to detect when people are lying, hedging or hesitating, you might stop listening to other the other clues that might inform your intuition. In my opinion, this was not one of the stronger issues of volume four. Gorgeous and riveting? Absolutely, but a little too much of one thing for my particular taste. 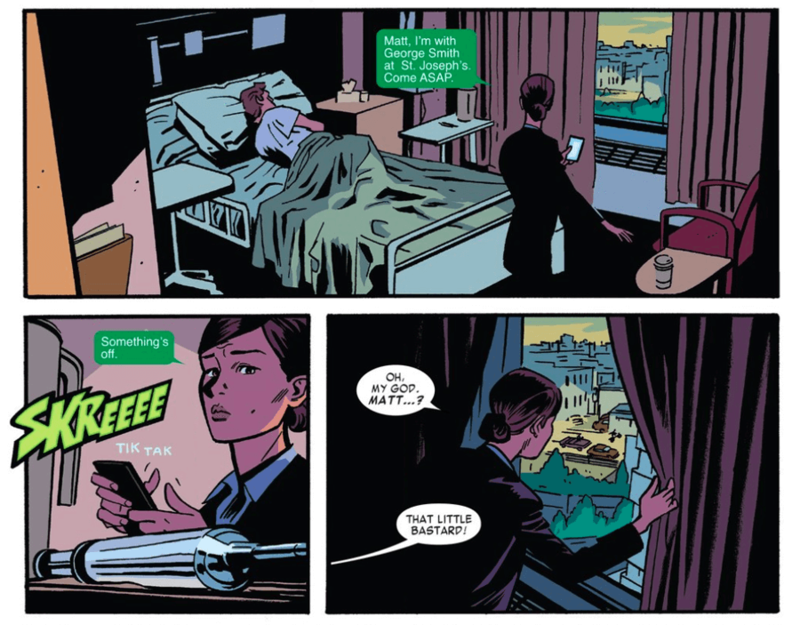 However, I really like what Waid and Samnee are doing with Kirsten McDuffie. People always tend to be divided over whomever Matt is dating (an interesting topic for another post), but I’ve been a fan of her character since at least Daredevil #12 (vol 3), and enjoy seeing her fleshed out a bit more, and becoming a major player in Matt’s life. I also continue to really enjoy Mark Waid’s voice for Matt. This issue opens with Matt thinking to himself: “On occasion, I have to convince people that I’m not suicidal. This will reassure no one.” This is perfectly in line with the sardonic wit that I tend to associate with Daredevil. It’s understated and sarcastic. It’s how I like my jokes. Speaking of Kirsten, how about that last page? I personally found it cute, and well-timed, and try not to think too much about whether Marvel intends to flip the switch on everything we know and love in the near future (I guess that’s yet another topic for a post). So, what did you guys think? Let us know in the comments! And I’ll get back to you soon with the latest issue of Superior Iron Man #4 which stirred its own bit of controversy! I liked the end of the issue. My problem was with the car chase. It was over the top silly. If Matt Murdock can do what he did with that car then why doesn’t he drive. The same goes for the motorcycle. I will say to me that this just shows that Waid is out of gas on this run. His writing was terrible and I mean if you haven’t read his Indestructible Hulk run then you should because it will baffling that he could write such great Daredevil stories and be so bad writing Hulk. I really look forward to the new start in September. I just hope that we don’t lose some of the things that Waid has brought to Daredevil. I like it when a writer that takes over does his version of the character but still finds ways to bring forward some of the other things writers before him has done. It still gives you the sense of growth for the character. I’m just hoping the end of this run will finish better then some of his other work. I agree with with you review on this one. A few things that occurred in the book seemed over the top, like the car chase, and a little campy, even for a DD comic book. Physics has to exist in one form or another for a street level comic of a non super powered hero. DD’s car scene in Born Again had a certain weight and believability to it. This one, DD driving a car with his cane, is, well, took me out of the story. Is this DD becoming the James Bond Roger Moore version? I did enjoy the art and the little interaction between Matt and Kirsten. Some of the best moments throughout this run has been the main character interactions. I would’ve liked to see that play a part more since Foggy’s cancer scare and the move to San Fran. I t seems to have taken a backseat to the action and 3rd tier villains. I do have to agree that this issue was lacking a bit. Especially considering the setup in #11 and the “Purple Children” story before it. I can get the issues with the car chase, but while the logistics may have been problematic, I think that Samnee and Wilson did a wonderful job in executing it. And it was nice that someone had enough interest in a character like the Stunt Master to try to tell a story that gives them something of a sendoff. Looking back on his history up to this point, I honestly doubt that he’ll ever be used again. I enjoyed the last page with Kirsten and Matt, but I would have liked to see more interaction with Foggy. (If I had a major criticism of this current volume, it would be that we haven’t spent enough time with Foggy or really followed his progress.) It was an entertaining issue, just not as substantive as a lot of what this team has already given us. Still, I don’t think that Waid and Co. have run entirely out of steam. I had a better time with this than I did with something like “Decalogue”; and that preceded “The Murdock Papers”, which was fantastic. I actually thought this was one of the stronger issues of volume 4. Fun, action packed, great dialogue and inner monologue. The “On occasion, I have to convince people that I’m not suicidal. This will reassure no one.” line is pure gold. And yeah it was absurd, but the car chase along with all the other action scenes in this two part story have been amazing thanks to Samnee. Out of character actions and dialogue, again for the sake of story they want. Needless changes to origins/character’s past. All of which Waid is guilty of in his run, but thankfully none of that showed up in this issue. This issue and the last (minus the utterly stupid book nonsense) have been a home run for me. Its all the little things to me that make this book better than 90% of Marvel or DC’s output month in and month out. The little green text bubbles there to easily visualize phone text messages. The dark lighting on Old Stuntmaster, eyes wide open when the doctor says he’s unconscious, foreshadowing his reveal mid-way through the issue. The damn facial expressions Samnee draws on Murdock. I LOVE the car chase. My favorite part was actually the end, where DD wins the stand-off with the ol stick in the motorcycle wheel trick from Indiana Jones and the Last Crusade. A fun visual and the kind of fearless climax you’d expect from the Stuntmaster vs the Man Without Fear. I love that over 50 issues later, Waid and co are still finding new ways to use Daredevil’s power set in inventive, visually interesting ways, with a colorful variety of adversaries. Not too long ago, DD was just beating up thugs in a bar or fighting the Kingpin/ninjas for the umpteenth time. I agree that this issue was not one of the stronger issues of the series, in fact issues 11 and 12, while entertaining, were pretty weak. I would be totally ok with that since I think its one of the things that makes Daredevil such a great book from its inception (deep compelling stories mixed with entertaining silver/bronze-age superheroe stuff), however I feel as though Series 3 and 4 have completely fallen short of deep, dark, compelling storylines that made Miller’s runs, D.G.’s run and pretty much all of Series 2 so awesome. I respect Samnee’s, Rodriguez’ and Wilson’s art for what they are and thought it was really cool at first, but now I’m starting to get a little tired of it. Waid’s writing is witty and concise and he starts to get into what makes this character so great, but then he just seems to fall short. For example the Purple Man storyline was the best of Series 4 so far, but it really could have been better and integrated into a larger plot that just seems to be missing. I can’t belive that I am bashing my favorite book like this, but its just been so unsatisfying lately. I do like the McDuffie stuff and he is doing great at developing that relationship and plot, and I am excited to see where that goes but some of this other stuff is just too gimmicky and more of a distraction. Lets give foggy cancer, lets disbar Matt, lets send him to San Francisco like we did once before. I feel like its been over 3 years of mediocrity. Ok, I think I’ve gotten that all off my chest. Hopefully Waid can turn this around.